The beautifull handcrafted applique hand bag from Bhuwaneshwar, Odisha. This season choose colours! Dare to be bold, bright and make the difference. This unique Eco-friendly natural high quality bag with applique pattern is the best choice. This hand embroidered appliques tote bag is perfect for a summer beach bag, perfect gift for holidays and maybe a teacher’s day gift. 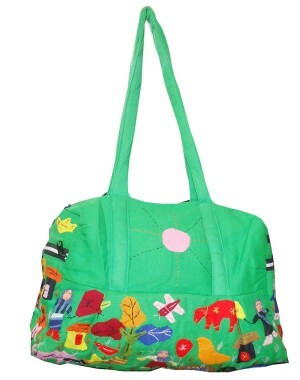 You will catch many glances with this amazing bag. This bag is perfect for everyday use to stash your essentials. It is a piece that will never go out of style. • Disclaimer: This kind of accessories product is handcrafted and may have slight imperfection and/or mismatch from the product shown in the image as its handcrafted by the artisans which makes the product unique.